Flying trucks for US combat troops in the midst of battle. 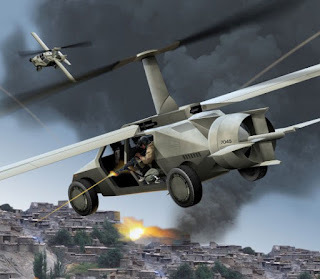 The US Defense Department's Advanced Research Projects Agency, DARPA, has an ambitious program well underway to rapidly supply and also evacuate troops in volatile circumstances with flying trucks. The code name is ARES, Aerial Reconfigurable Enabled Systems. Vehicles that drive and fly nimbly and with speed. ARES is part of DARPA's Transformer program which has been very successful in the development of flying cars. DARPA's flying trucks are dual-function vehicles for high speed vertical takeoffs and landings. They hover and land with two tilting fans. The vehicles are capable of high speeds during flight. To reduce ground threats, DARPA researchers focus on unmanned, autonomous aerial logistics systems. Aerial threat evasion from, for example surface to air missiles, is being built in. Also resistance to IED (Improvised Explosive Devices) is a priority for the vehicles. The military importance of this program is significant. Ground transportation in combat areas is highly dangerous. The trucks are subject to ambush and IED's. Primary purpose of ARES is to cut risks to logistical deliveries for combat troops. Those deliveries are substantial. US combat outposts require 100,000 pounds of material every week. Like the flying car was originally developed by DARPA for the military, the flying truck has significant commercial and consumer applications globally. Imagine a morning commute with no trucks on the freeway snarling traffic. Instead, they are aloft making their deliveries by air.